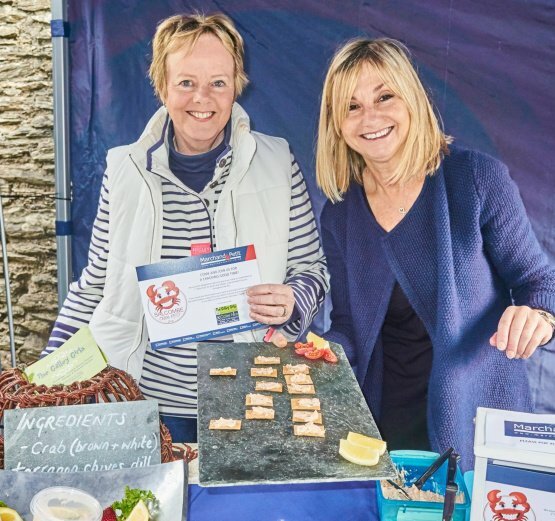 Marchand Petit has been busy over the first Bank Holiday weekend of May - team Marchand Petit Salcombe loved meeting all the visitors at a packed Salcombe Crabfest. Liz Williams of Salcombe was the happy winner of our fabulous hamper overflowing with local produce delicacies. The crowds were treated to hands on demonstrations, crab picking tuition, commercial crab fishing talk, demonstration kitchen, crab pot making, music, wine tasting and much more! Marchand Petit was delighted to be supporting the event by running a stand packed full of tempting crabbie goodies. What a day it turned out to be in Island Street and across Salcombe. Congratulations go out to all the organisers of Salcombe Crabfest – Rotary Club of Salcombe in conjunction with Salcombe Information Centre, Favis of Salcombe and Coast & Country Cottages - raising money for local and national charities.